A scream cut through the cool night air, but no one was around to hear it. A small boy of around five years old huddled against a tree trunk, crying desperately. His short brown hair was plastered against his brow, tears staining his freckled face. “Mommy!” he screamed. “Mommy save me!” He stared fearfully at a dark cave from which a deep rumbling resounded. Smoke billowed from the cave’s mouth, and light flashed from within. The boy’s eyes widened in fear, and he stumbled away from the entrance. 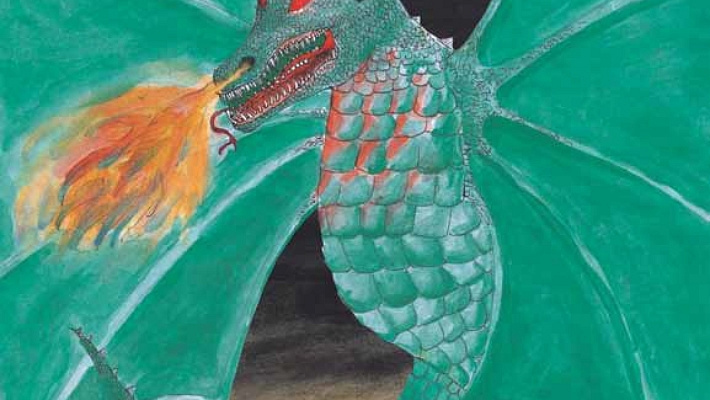 A large dragon emerged from the inky blackness, fire spurting from its nostrils. Its scales glowed a dark green, and its eyes flashed red. The boy screamed, but there was no hope. The dragon slowly advanced, its eyes cold and calculating. Its back legs tensed, and the dragon sprang over the little boy, briefly expanding its wings. It began to herd the boy into the cave, occasionally spurting fire to keep him moving. The boy soon reached the cave. He took one look at the dragon and rushed into the cave, fruitlessly searching for a chance of escape. The dragon followed him, its intent obviously successful. There was a piercing scream, then silence. The dragon emerged from the cave, blood dripping from its muzzle. Lily knew she was going to die the moment she heard her name. She raised her eyes to the center of the village square, hoping she had mis-heard. An old man with matted gray hair and sunken, hollow eyes stared back at her. He stood beside a worn barrel, holding a slip of paper in his hand. Strong arms lifted her from the ground. She looked up into the face of her oldest brother, Peter. His wavy golden hair hung around his face, freckles splattered across his nose. He gently stroked her long brown hair, whispering words of comfort to both her mother and her. But her mother would not be consoled. “She’s only twelve!” she wailed. Lily couldn’t think. She had seen this happen every year. All the children wrote their names on a slip of paper, including her, and dropped it into the barrel. No one really knew where the barrel had come from, but there was a rumor that it was the only object that survived the dragon’s first raid. The old man would draw a slip of paper, make the speech, then send the child on their way. No one had ever returned. Lily’s sharp green eyes filled with tears, but she tried to hold them back for her mother’s sake. Lily was not athletic or clever; she knew she had no chance. She stumbled back to her family’s cottage in a daze and flopped onto her mat. She fell asleep without bothering to eat and dreamed of gruesome deaths and dragons. It was still dark out when Lily woke. Her mat was warm and comfortable and, for a second, she forgot her despair. But it all came rushing back when she remembered the events of yesterday. Lily quietly sobbed into her pillow. She didn’t want to die. There was so much she had to live for. It was her dream to one day have a family of her own, and have children who could live without the threat of a dragon hanging over their heads. Now, that would never be. Her older brothers stirred beside her. She had three: Peter, John, and Mark. She loved them all dearly. That was another thing. Her mother would be completely broken if she died. She was her mother’s only daughter, the only one who still wasn’t grown up. Peter was eighteen, John was sixteen, and Mark was fifteen. Her brothers rolled out of bed and began to get dressed. Their faces were tearstained. It was all she could do not to start crying again. Looking at them, she realized what wonderful brothers they had been. She rushed over and threw her arms around them. “I love you!” she cried. They hugged her back awkwardly, not sure how to respond. The family sat down to breakfast, no one sure how to act. Lily’s mother wore a pained expression, like she was trying to hold herself together for Lily’s sake. Lily’s father had died several years before in a fire. He had previously worked as a blacksmith, and a clumsy apprentice had let the fire get too close to the wood. Lily’s father, his two apprentices, and a delivery boy had died in the following fire. Although the boys provided for the family, her father’s death created a gaping hole in their lives. After breakfast, Peter drew Lily aside. “I… I want you to have something,” he said in a cracked voice. He silently held out a small hair clip. It was shaped like three lilies, her namesake. They were a creamy white with traces of pink in the middle. He gently clasped it into her hair, then stood back to admire her. “Remember me,” he whispered. With that he turned away and walked off. Lily nodded her thanks. She hoped he was right. She couldn’t bear to do anything else, so she huddled by the door, waiting for the guards to come get her. It seemed like she had just sat down when it was time to go. She was about to walk out the door but was stopped by Mark. He silently handed her a knife, motioning for her to hide it in her tunic. “Thank you,” she mouthed as the guards dragged her away. They led her to a small rowboat that contained two more armed guards. She was wedged uncomfortably between them as the boat was pushed off the shore. The river was strong and swift, rushing along the banks. The water was dark and murky, hiding jagged rocks beneath its surface. “All right,” one of the guards said roughly, “this is how it’s going to work. When we arrive at the dragon’s island, we’re going to leave you on the shore. The dragon will come out when he feels like it.” Lily nodded, not trusting her voice. She had never been so scared in her life. The boat gently bumped against the shore. A guard jumped out onto the shore and drew the boat closer to land. Lily stumbled out. The guard gave her a final shove and jumped back into the boat. Lily fell onto the sand, swallowing a lot of it in the process. When she finally managed to get up, Lily watched her last hope disappear into the unforgiving darkness. Not knowing what else to do, Lily took out Mark’s knife and began to draw pictures in the sand. First her house, then her family, and all the other things she knew she would never see again. The moon rose higher and higher in the sky, but still no sign of the dragon. Lily felt herself slipping into the land of dreams and struggled to stay awake. Just when she was about to give in to sleep, a deep rumbling began. Lily jumped to her feet. Smoke began to pour from the entrance of the cave, fire leaping through the dark. Slowly, the dragon emerged. It was even worse than Lily had imagined. Fire surrounded it, and its scales were forest green. The worst part was its eyes. They were a deadly red that flashed amidst the smoke and fire. Lily immediately realized that there was no way she could use the knife against it. She couldn’t get close enough. Her only hope was John’s bow and arrow. She stumbled away from the dragon and grabbed her bow. With the string pulled taught, she carefully aimed the arrow where the dragon’s heart would be, and shot. No!” she wailed as the dragon began to close in. Her loved-ones flashed before her eyes. Mum, Mark, John, and Peter. Peter! She quickly fumbled with her hair, and withdrew the hair clip. Hoping against hope, she examined it, searching for a way to save herself. She found nothing. There were no sharp edges, nothing that could be used as a weapon whatsoever. In desperation, she threw the clip at the dragon and huddled against the sand. A sound of retching occurred. Lily looked up, confused. The dragon had swallowed the clip, but it had gotten stuck in its throat! Unluckily, that didn’t seem to slow it down. It slowly drew in its breath to deliver the fire that would be her downfall. 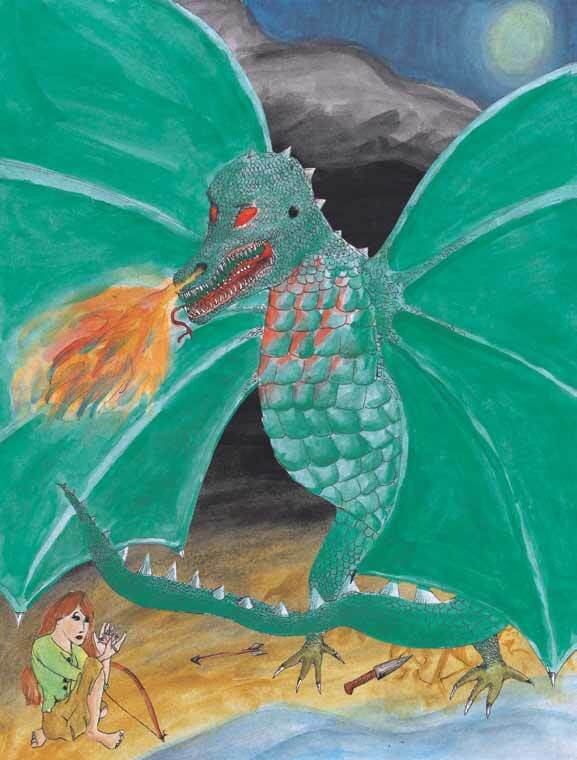 The fire bubbled up the dragon’s throat, hit the clip, and bounced back towards its stomach. A howl of pain and rage tore from the dragon’s lips. It gathered itself the hottest and strongest ball of fire it had ever blown, and let her have it. But the fire bounced off the clip again. This time, it didn’t just hurt the dragon. The fire rushed into its stomach, fatally burning it. The dragon let out a terrible, strangled roar and crashed down, dead. Lily stood up tentatively, not sure what to expect. The dragon lay on the shore, the water lapping at its scales, trying to draw it into its depths. Smoke poured from the dragon’s corpse, and Lily dropped to her knees, retching from the horrid gas. 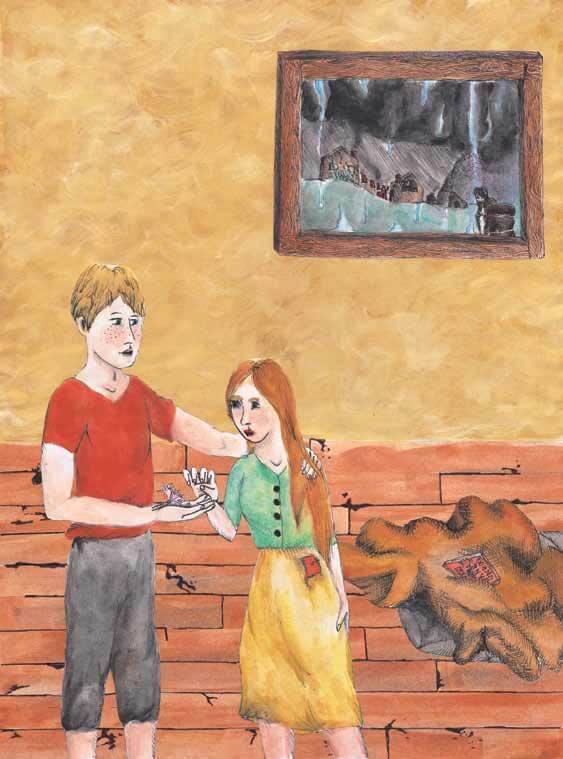 When her throat had finally cleared, Lily stood up again, her eyes still watering. She walked unsteadily to the body of the dragon and shoved against it, trying to shove it into the river. The current helped her, and soon all that remained of the dragon were a few badly scorched scales. 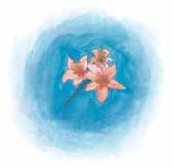 Lily sat on the shore, silently crying. She wasn’t sure why she was crying; after all, she had defeated the dragon. But what about all the other lives that had been lost? Lily stopped herself; there was nothing she could do about that. But, thanks to her, no one would be sacrificed to the dragon again. Lily was so lost in thought she didn’t notice the thing in the water until it had bumped against her leg several times. Lily groped around in the water until her hand closed around an oddly shaped object. As she held it up in the moonlight she recognized the lily hair clip Peter had given her. She gave a strangled laugh. Who knew that the hair clip, of all things, had saved her life? Gently Lily clasped it into her hair once more, then curled up into a ball on the shore and fell asleep. When the sun rose, Lily was still sleeping. She did not hear the boat bump against the shore, nor did she see the two guards make their way towards her. “Is she dead?” one of the guards wondered aloud. “Nah, just sleeping,” the other one replied. At that very moment, Lily awoke. At first, she didn’t know where she was, but it all came back to her in a flash. The guards asked her what happened, and she told her tale as they loaded her into the boat. By the time she finished, they had arrived at the village. “The smoke reached the village, and we were afraid that our offering hadn’t appeased the dragon. We had been sent to see if it was still on the island. It’s a good thing too. If it weren’t for us, you’d still be stuck on that island. Soon word got around that Lily had returned and the dragon was dead. People rushed to the docks, not ready to believe the wonderful news. But Lily had eyes for only four people in the crowd: her family. She rushed into her mother’s waiting arms and wept with relief. Her eyes met Peter’s, and she smiled. Lily couldn’t wait to get home and tell him everything.